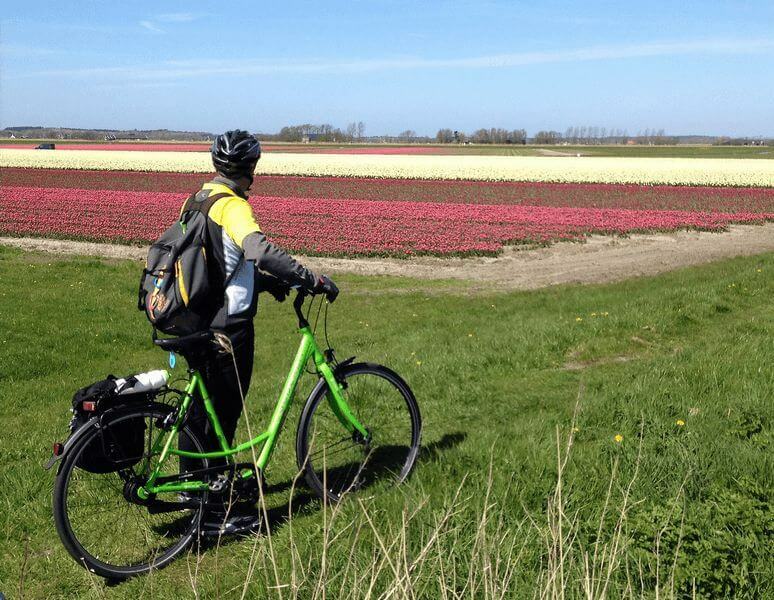 Cycle and sail the provinces of South- and North Holland while spring flowers are in bloom. 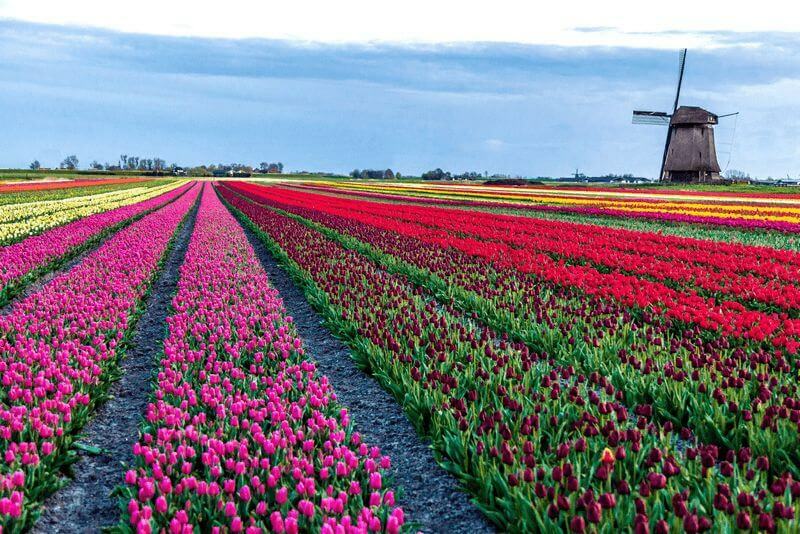 This is the time of year that tulip fields glow in innumerable colors, thousands of daffodils make it seem like the sun has fallen on earth, and hyacinth fields spread their sweet scent for all to enjoy. That’s just the beginning, because there is a whole lot more to this region. You’ll be completely surprised by the enormous variety of scenery in such a small area. You’re going to experience it all on your bike or from the comfort of the ship. 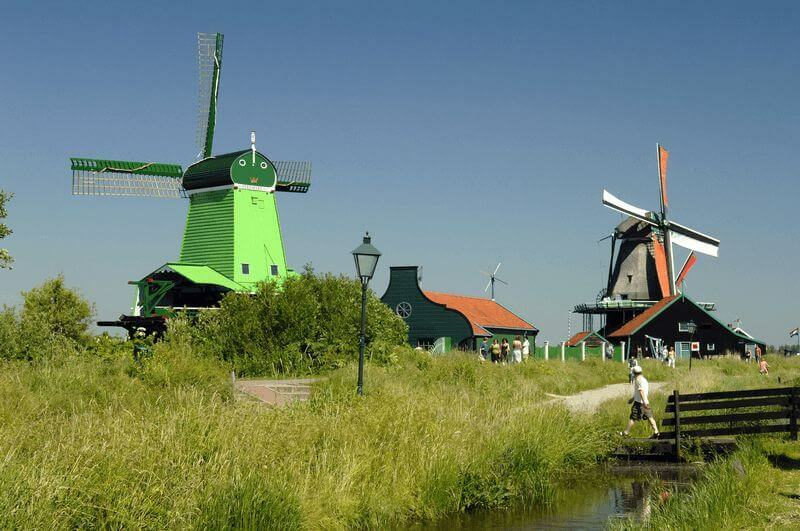 See beautiful medieval cities and small fishing villages, centuries old windmills and locks still in use, wide green polders and wetlands. Get out of the wind relaxing in the dunes by the North Sea, or feel it in your hair and on your face on the beach. You may even want to dip your feet in the still rather cool sea. 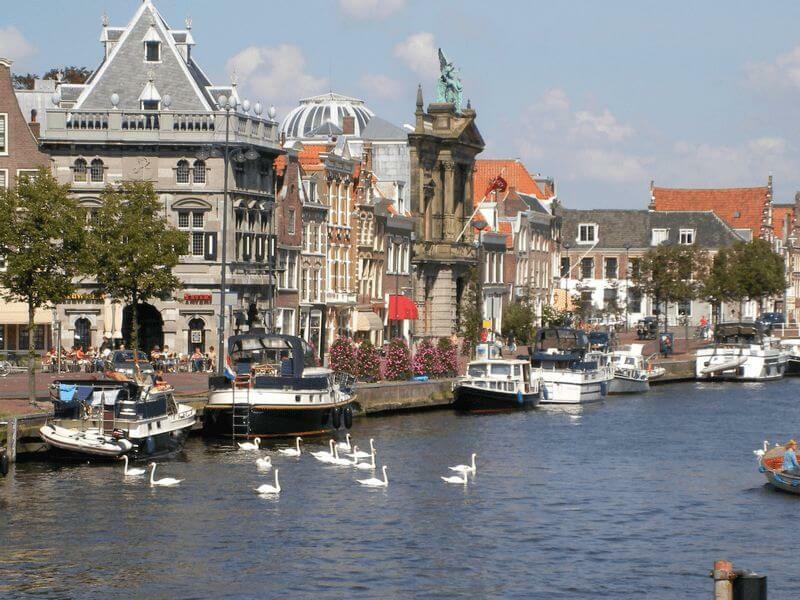 The tour also takes you to the historical cities of Amsterdam, Alkmaar and Haarlem. Park your bike and explore them on foot. It’s the most relaxed way of enjoying their beauties (and find the best café’s and terraces). In several museums, you can delve into the history of the region. Learn about tulip growing in the area while visiting both the famous Keukenhof gardens and the lesser known Hortus Bulborum garden museum. 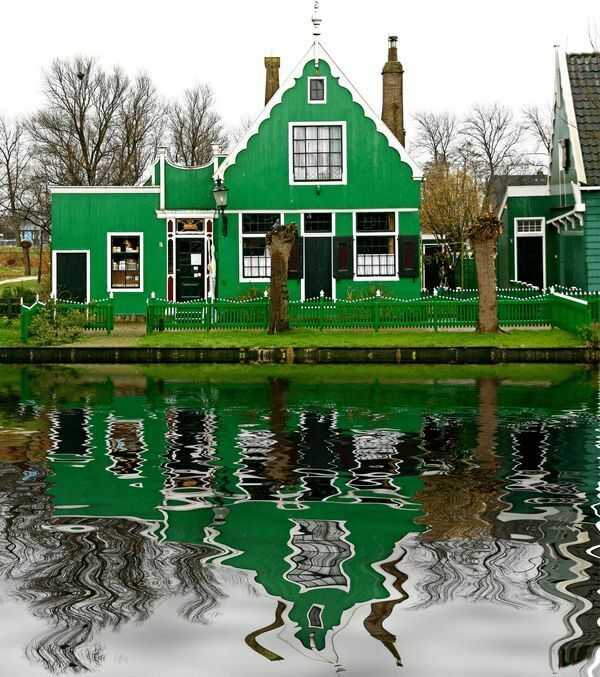 The Zaanse Schans open air museum shows you what villages and village life looked like in older days. And when in Amsterdam, there’s a museum for every kind of interest. Be it old Dutch masters or the most contemporary art, be it historical or maritime. 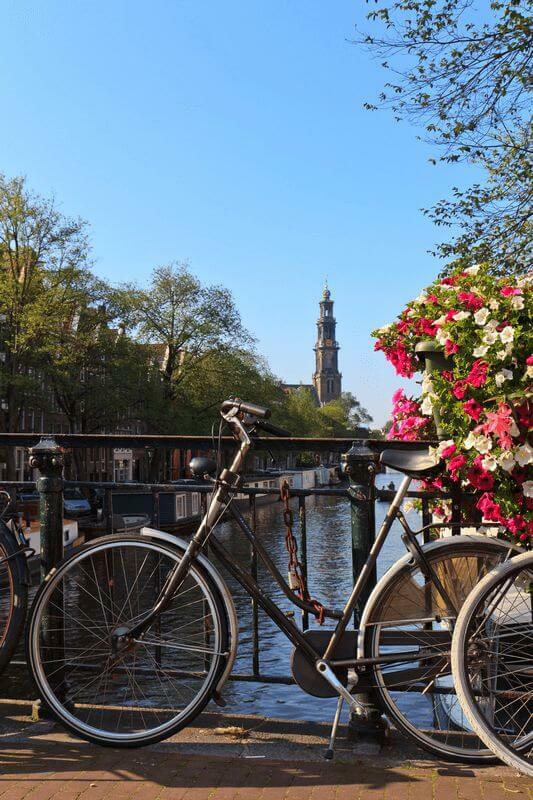 This wonderful bike and barge trip starts and ends in Amsterdam. 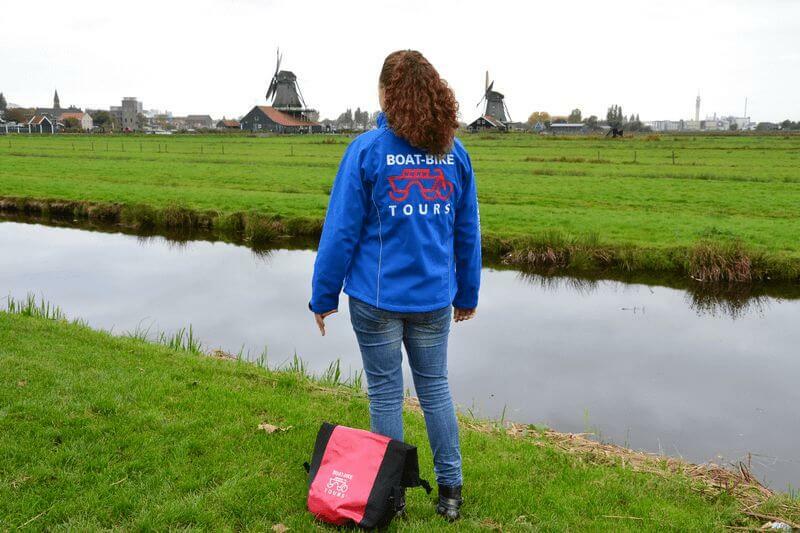 A well trained, multilingual guide gives you a daily briefing, a map and route descriptions, and then you´re off on your own to discover the treasures of this intensely Dutch area. Each evening, you’ll return to your floating hotel barge, docked in a harbor along the route. The De Nassau is a totally renovated ship, whose very comfortable cabins and suites can house up to sixty passengers. It’s the perfect place to recuperate from your day’s cycling tour. Tasty food is served in the lovely dining area. The pleasant lounge is the meeting and relaxing place for evenings of fun while reading, playing board games or enjoying the company of your co-travelers. On sunny days, the partially roofed sun deck with chairs and loungers is a good place to be as well. And then, a good night’s sleep on the excellent bed gives you a fine basis for next day’s tour. This tour is semi-guided. That means you will get a daily briefing, map and route description from your tour leader, but you’ll cycle on your own. In case of emergencies, problems or questions your tour guide is only a phone call away. Between 1 and 2 p.m. the crew welcomes you on the ship and checks you in. 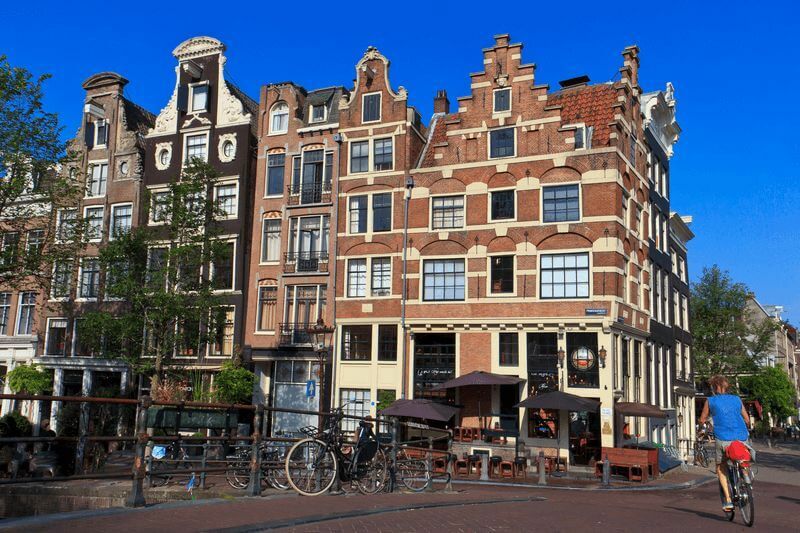 After that, you´re free to explore downtown Amsterdam any way you like. Go shopping, visit a museum, have a drink in one of the many cozy café´s or make a canal cruise. Around 6 pm we expect you back on board for a welcome drink and dinner. After dinner your tour leader gives you more information about the week´s program and about cycling and safety procedures. You spend the night on board in Amsterdam. 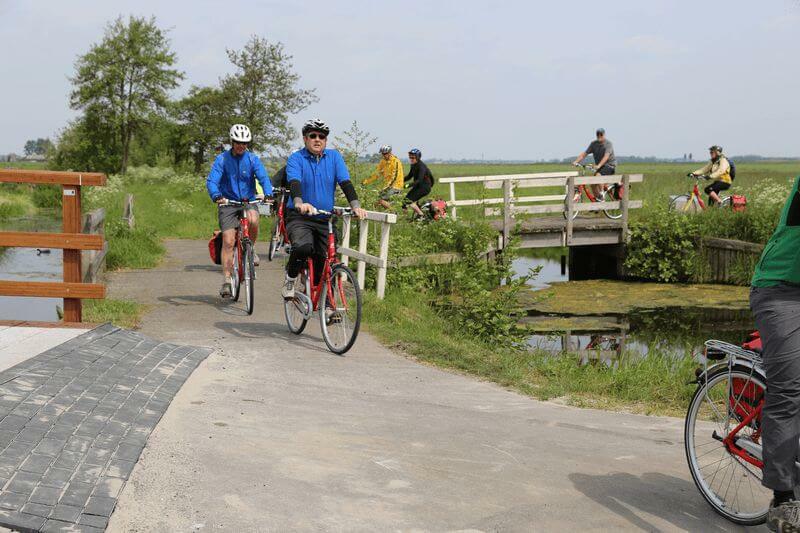 The first cycling trip of this tour takes you via small villages through the beautiful and green wetlands of Waterland, a rural nature reserve with hundreds of small lakes and tiny canals. 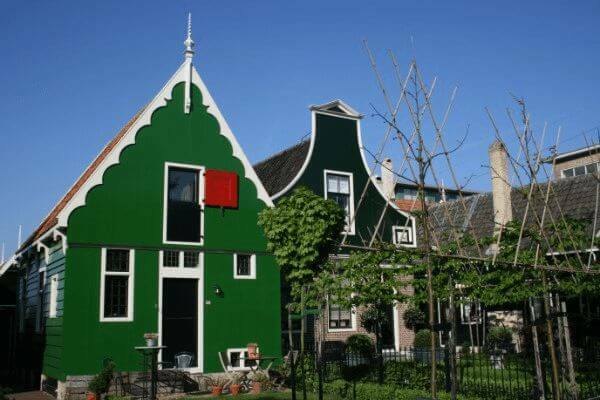 Near fishing town Volendam you can visit a cheese making farm. 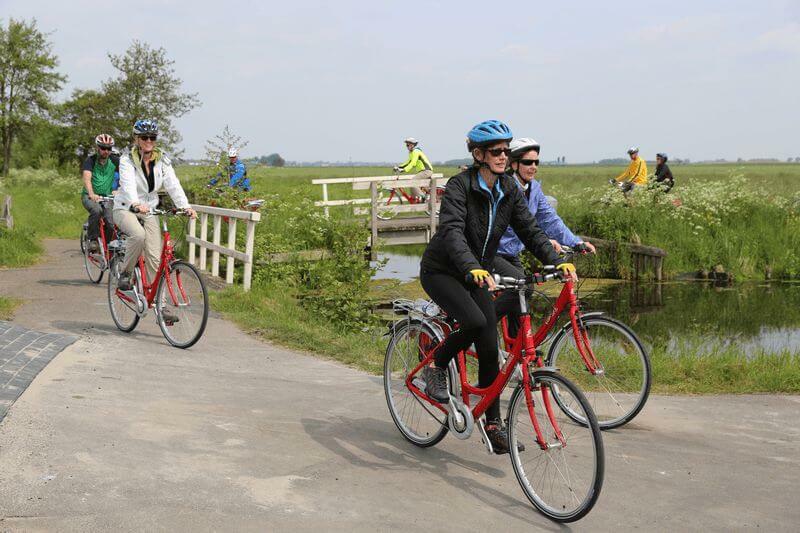 Though it requires some extra cycling miles, we highly recommend a tour to the former island of Marken. Its inhabitants dealt with the surrounding water by building homes on artificial hills and later on piles. Via the Waterland region, you return to Amsterdam. From there, a short “dinner cruise” brings you to Zaandam. 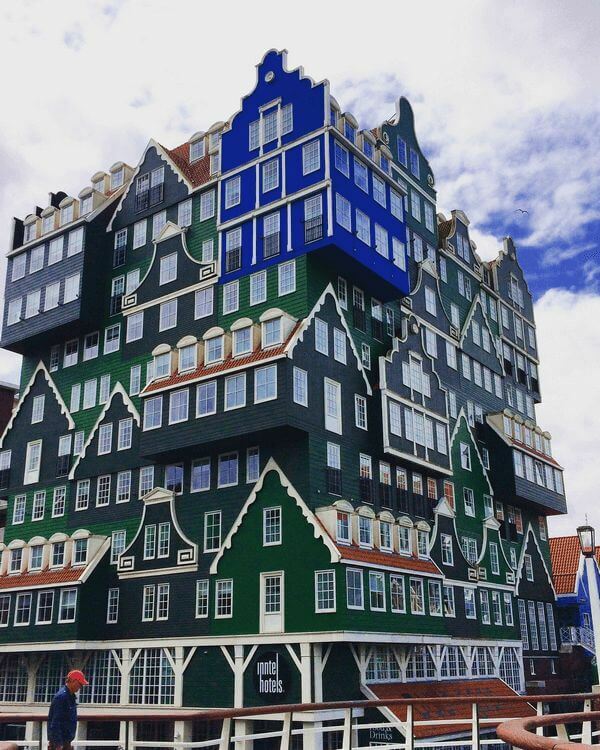 We dock in the town’s center for the night, but before turning in your guide will take you on a short walk to some of Zaandam’s most remarkable sights. 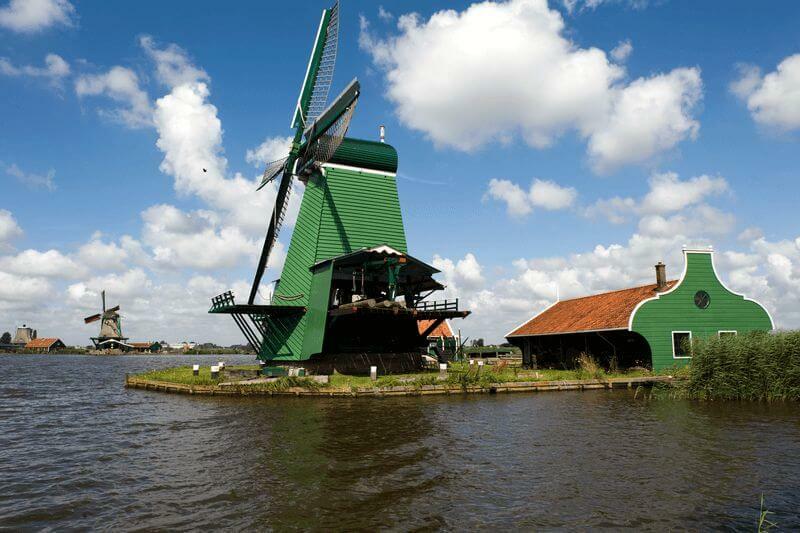 A pleasant 5 km bicycle ride brings you to ‘Zaanse Schans’. An old Dutch village with beautiful windmills still in use, traditional wooden houses and artisans like a cheesemaker and a clog maker. 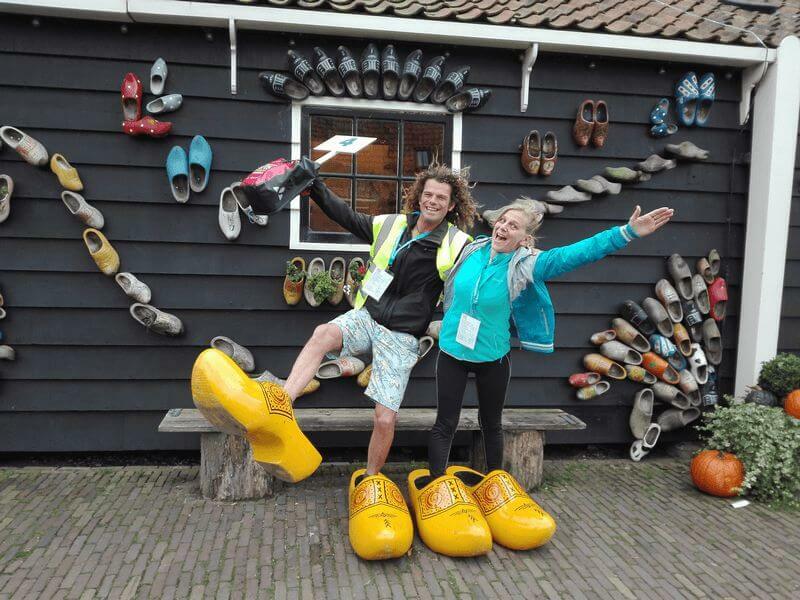 Yet Zaanse Schans is more than an open air museum, because the people you see are actual inhabitants! 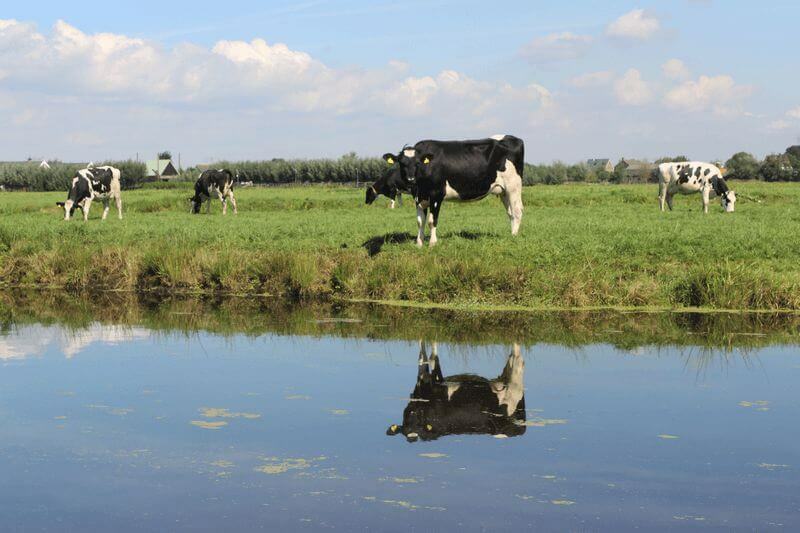 Your tour continues through the “Land of Leeghwater”, a gorgeous green polder area. 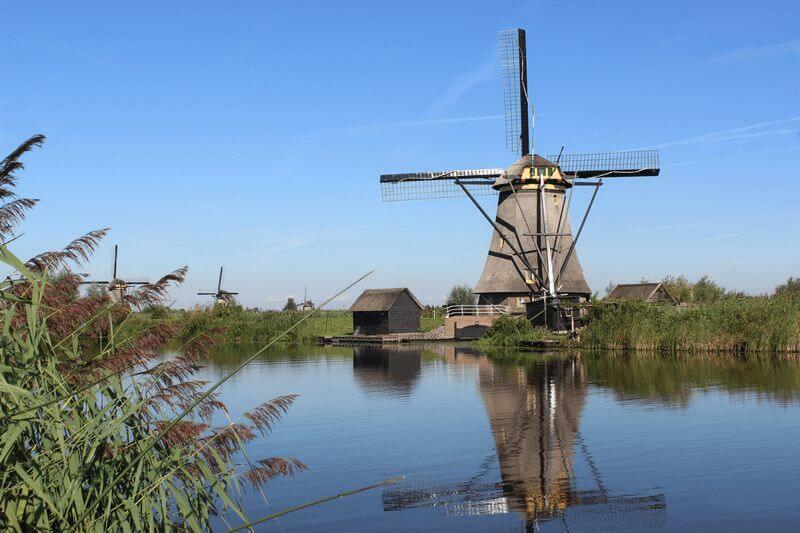 Stroll through the former whaler’s village of De Rijp and pass by the windmills of Schermerhorn. In cheese city Alkmaar your ship De Nassau will be waiting for you near the historical city center. As you wander through the streets of Alkmaar’s Old Town, you’ll be amazed by the beauty of its well-preserved 17th century buildings and narrow, winding canals. Today’s bike tour brings you to lovely tulip fields north of Alkmaar, then to seaside resort Egmond aan Zee, pleasantly situated in the dunes near the North Sea. The sandy beach is one of the most beautiful of the Netherlands and great for a walk, a swim or simple enjoyment of the view. Close by, the pretty artist’s village of Bergen is definitely worth a visit. Both towns are close to the North-Holland Dune reserve, a 5.300 hectare large forest- and dune area with unique landscapes. Return to the ship in Alkmaar for dinner. This morning you cycle to Egmond-Binnen and then to Limmen. In this village you’ll visit the Hortus Bulborum, a unique garden museum dedicated to the preservation of rare and historic bulbs. 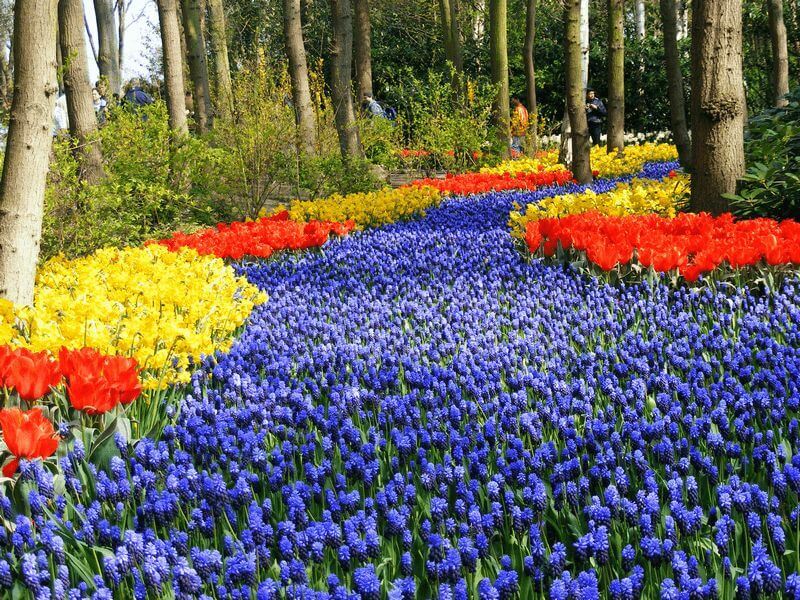 Some of the over 3500 tulips, daffodils, hyacinths and other flowers planted here are nearly extinct in the rest of the world. 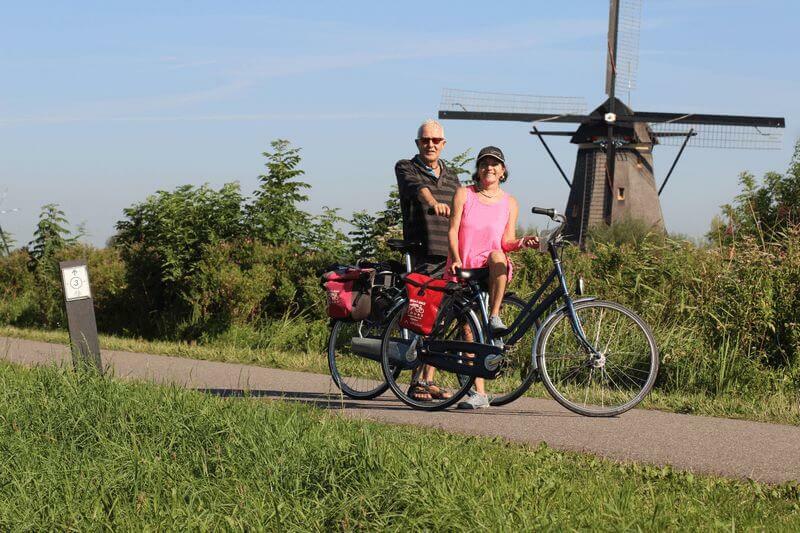 Your cycling tour continues through colorful tulip fields and brings you back to Zaandam. 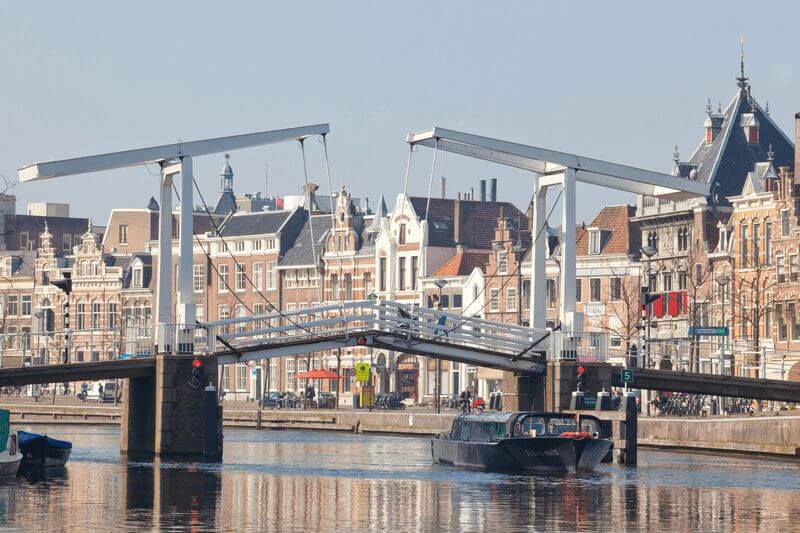 The De Nassau will be waiting for you to take you to Haarlem on a leisurely afternoon cruise. It will dock for the night within walking distance of the city center. 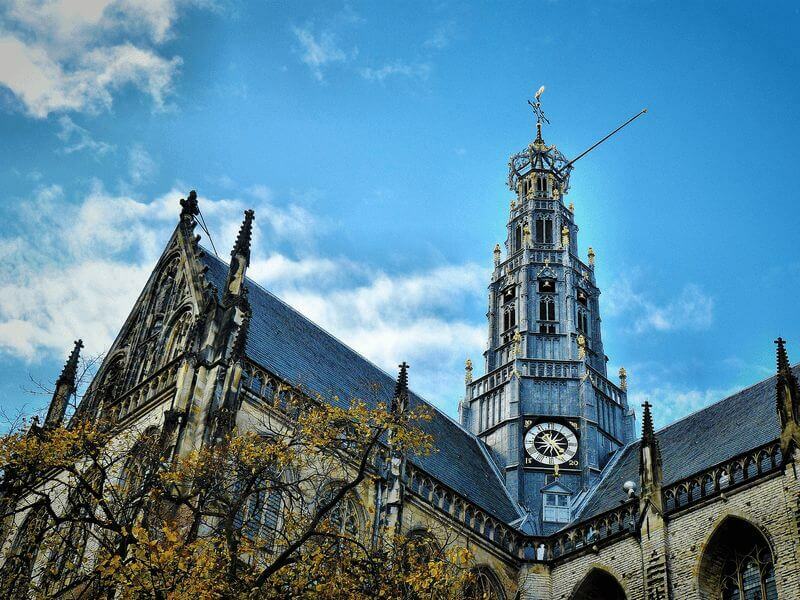 Grab the chance to visit the exceptionally beautiful historical inner city at the end of the afternoon or after dinner. The Grote Markt and St. Bavo church are impressive indeed. 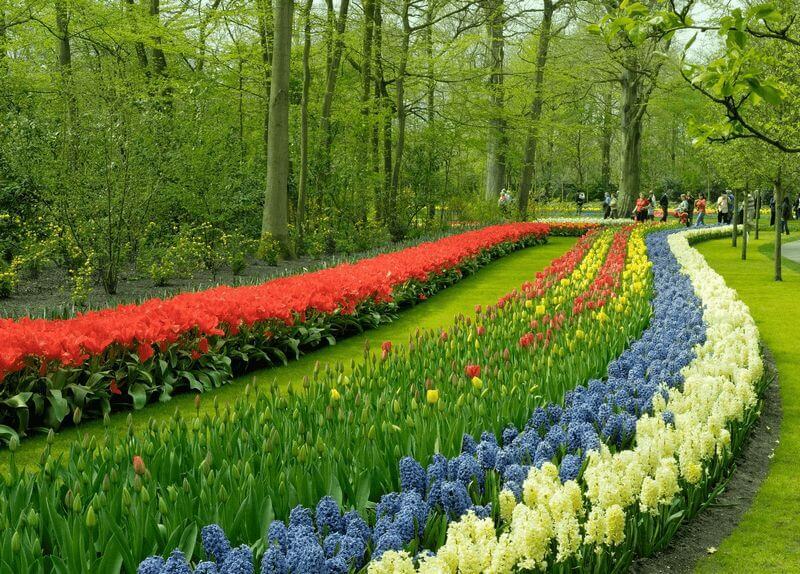 Today’s trip leads you through the oldest tulip fields of Holland to the Keukenhof gardens. 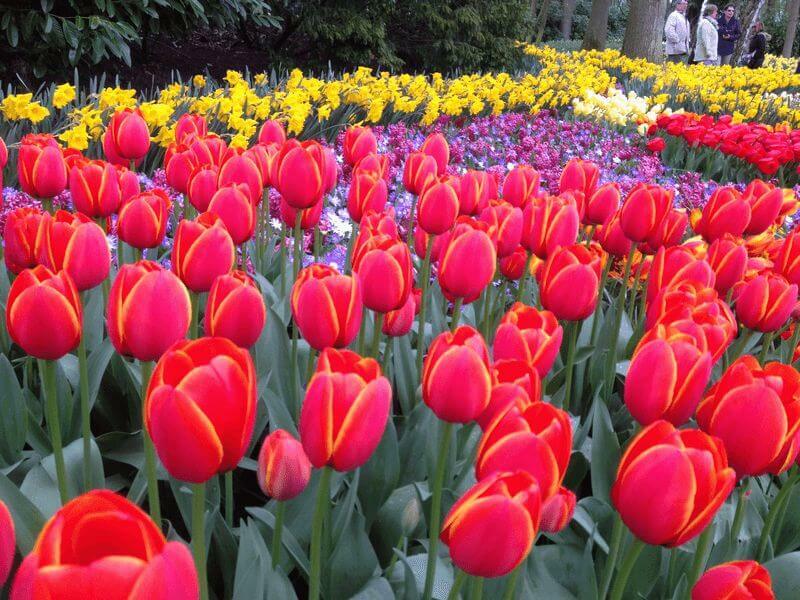 This flower bulb park is an overwhelming blaze of colors of seven million flowering tulips in a magnificent 80-acres setting of traditional and modern garden architecture. 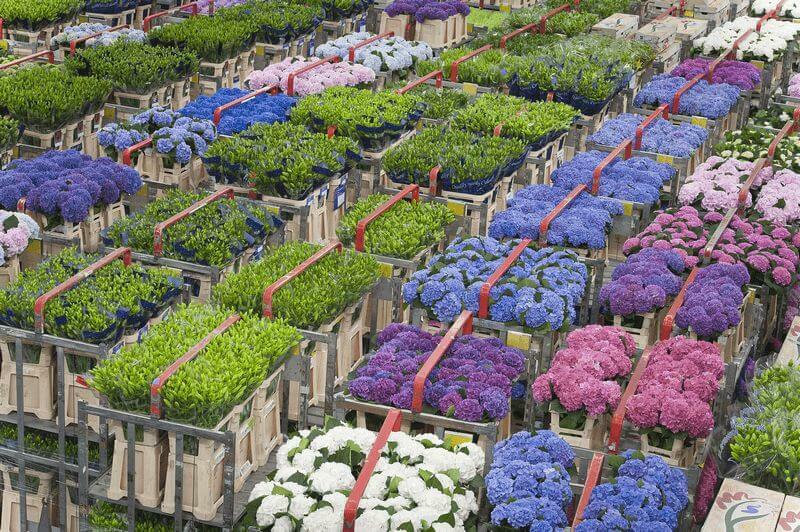 You can also revel in the beauty and fragrances of various hyacinths, daffodils and many other colorful flowers. In the afternoon you cycle back to the ship in Haarlem. Your last bike tour brings you back to Amsterdam. You will enter the city from the west through a pleasant green area. You can use the afternoon to discover more of this amazing city. 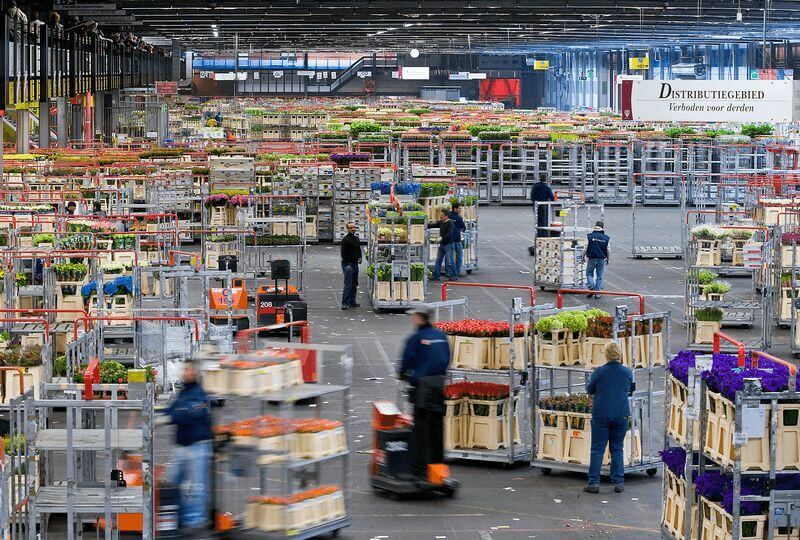 Visit the inner city flower market, go to the Vondelpark, a museum, or just look at life in this city that never sleeps: there is something interesting to do for everyone. For those who want to do an end-of-day canal tour we offer tickets at a reduced price. End of your tour. Enjoy a good breakfast before disembarkation, until 9.30 a.m.
A helmet can be rented for € 10 per week, only on prior reservation and payment.